The Independent Production Unit in TV3 is compiling a panel of producers, assistant producers and researchers with experience in documentary programme making, who might be available to work on projects on a freelance basis from 2018 onwards. If you are interested in applying to be part of this panel, please forward your CV and cover letter outlining relevant experience to jobs@tv3.ie with ‘IPU Panel’ in the subject heading by 8th December. Please outline the date you are available from or notice period, as well as your salary expectation. TV3 is an equal opportunities employer. The Western Region is comprised of Clare, Donegal, Galway City, Galway County, Leitrim, Mayo, Roscommon and Sligo. The WRAP Fund will assist in increasing production and employment in the region by providing access to seed capital funding in the form of development and production finance and cash flow. Applicants should have at least 5 years professional experience in the audiovisual industry at a senior managerial level with a proven ability to manage and work productively with people. Ideally, have a broad spectrum of interest and a track record of working in the four genres of the audiovisual industry that are being targeted. An ability to recognise projects with a commercial and international appeal as well as an ability to spot the potential of projects at an early stage of development. A proven understanding and ability to draw up contracts and assess budgets for projects that will realistically enable them to achieve the vision proposed. An ability to advise on the production process in order to avoid pitfalls. An ability to advise on how and where to seek co-production partnerships. The talent and ability to assess and write up a succinct synopsis of projects to a short list stage, identifying the genre and audience focus. A creative imagination accompanied by emotional as well as intellectual intelligence. An ability to encourage and advise as well as reject with empathy. A self-starter with an ability to manage a large and varied workload and work independently. An ability to promote and market the fund at every given opportunity. Undertake special tasks as may be assigned by the company. 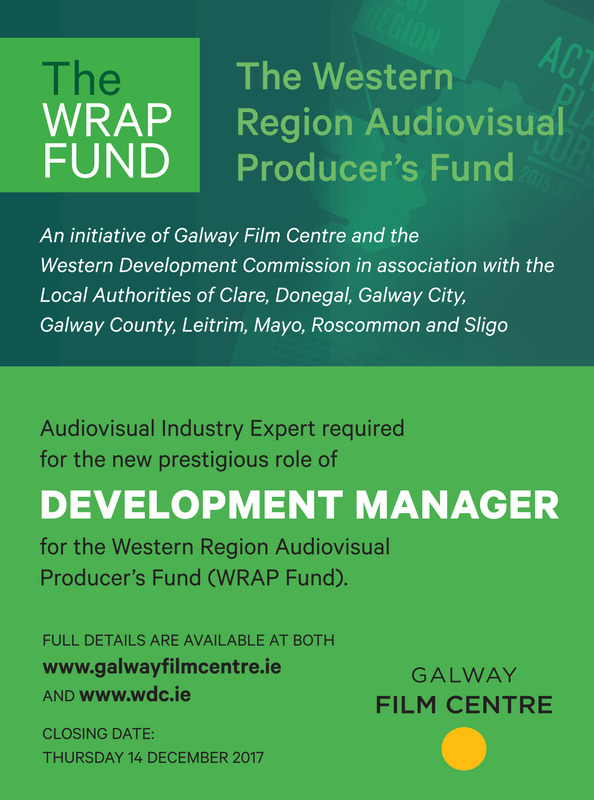 The base for this position is located at the Galway Film Centre Offices, but the Development Manager will be expected to deliver on the fund throughout the Western Region, and represent the fund both nationally and internationally. Closing date for receipt of applications is Thursday, 14th of December, 2017. Shortlisted applicants for an interview will be required to make a 5-minute verbal presentation, without aids, on their vision of the fund. The position will be offered on a 3-year fixed term contract. The annual salary is €60,000. Further information regarding the position is available here: WRAP Fund Job Description. Windmill Lane Pictures are seeking an experienced Digital Media / VT Operator to join their Digital Media and VT department. The ideal candidate should have a minimum of four years experience within the post production industry. An in-depth knowledge of various non-linear editing systems including Avid, FCP and Premiere Pro as well as familiarity with Photoshop and DVD Studio. Possess a comprehensive knowledge of common file formats. Dispatching digital media across a range of online platforms is an everyday task. Familiarity with file based workflows from initial acquisition to final broadcast and DPP delivery requirements. A basic understanding of cinema deliverables and the creation of DCPs would be a distinct advantage. The ability to coherently advise clients on broadcast and cinema technologies. Computer literacy and a technical aptitude is essential as the role necessitates a methodical approach to troubleshooting both hardware and software issues. They are looking for Operatic, Pop, Musical Theatre or any other kind of singers for a new commercial. Casting is Wednesday 1st April so send on a video of you singing and include a word document with details of your singing experience (or none) along with all your contact details (Name, Address, Phone, email, DOB) to commercials4louisekielycasting@gmail.com as soon as you can. Please put SINGER in the subject line. Line of Duty series 3 will shoot in Northern Ireland from April to July. The production currently seeks talented crew across all departments. To apply please email your current CV along with your full contact details and the contact details of two industry referees to LOD3Belfast@yahoo.com with the job title that you wish to apply for in the subject line by Friday, 13th February 2015. PLEASE NOTE: Successful applicants will be invited for interview by 20th February. If you have not been invited for interview by this date your application has not been successful. Antidote are looking to get in touch with freelance editors who would be interested in being contacted for work in their in-house offline suite. CVs and links to work can be sent to tanja@antidote.ie. Fraser Models and Actors is looking for music festival type people, late teens to early 30s, for a forthcoming commercial. This is a PAID project and will be filming mid to late August. Setanta Sports is currently recruiting for a highly committed individual to join their Advertising Sales Team in the capacity of a Video & Motion Graphics Designer. This position presents a superb opportunity to gain or build experience in a dynamic company within the broadcast industry. This position is a part-time position for 2½ days per week. Researching and creatively composing links into and out of programmes. Recording continuity voice overs and inputting of relevant information into our scheduling system. Recording of presentation items, such as menus and credit squeezes. Recording promos for the Newsroom, Midweek and other programmes when required. Ensuring Branding Guidelines are adhered to across all voice overs. You must include a voice over demo in order for your application to be considered. Experienced Audience Researcher/Co-Ordinator required ASAP for large scale, shiny floor, light entertainment shows. Must be able to locate and co-ordinate large audiences for block recordings between the end of June until September. The candidate will have experience and proven track record in finding audiences for large studio shows or similar events requiring large audiences. This is an exciting opportunity for an enthusiastic and driven tv professional to work across a number of high-end tv series in 2014. Grand Pictures require an experienced AP for new comedy panel show pilot for Sky. This will be a 6-7 week contact starting ASAP based in Dublin. Screen Scene VFX is looking for a Senior 3D Generalist to work on their upcoming project(s). To apply please reference “3D_Generalist” in the subject line to vfx@screenscene.ie. Screen Scene VFX is looking for Submissions to their Rotoscope Intern Program to work on their upcoming features/projects. Screen Scene is looking for a number of eligible candidates to take part in their 6-month Intern program. Successful candidates will learn the basics of Nuke Rotoscope and junior compositing to industry standard. As well as becoming familiar with the VFX process and pipelines. Ideal candidates should have a critical eye for detail and also possess the ability to multitask, prioritise and problem solve in a diligent and timely fashion. The ICCL Human Rights Film Awards is Ireland’s first and only short film awards dedicated to human rights. Launched in 2009, the ICCL Human Rights Film Awards aims to bring together the best in filmmaking with the most passionate human rights advocates. The initiative has continued to grow over the past four years. Remuneration: Voluntary. Pre-approved out-of-pocket expenses, including travel costs, incurred during the internship will be reimbursed. Screen Scene VFX is looking for a Senior FX VFX artist to work on their upcoming project(s). Windmill Lane are looking for an experienced Post-production Producer to join their busy commercials team. The ideal candidate should have minimum of 3 – 5 years experience working as a Producer in Post, with a high level of knowledge of the Post-production workflow. Cork Film Festival is now recruiting the newly created position of Festival Producer, to lead the Company into its exciting future. Reporting to the Festival Board, and working closely wih the Creative Director, this experienced arts producer will take lead responsibility for producing the Festival programme, and running the Festival organisation. The ideal candidate will demonstrate a deep passion for and knowledge of the arts; exceptional experience of producing and managing performing arts events; strong general management, financial skills, and personnel management; experience at generating and managing sponsorship and partnership relationships; and an ability to collaborate, negotiate and influence at multiple levels. Knowledge of the film sector, experience in festivals, and production of live music and arts events will be an advantage. All candidates will be considered, and the successful one will need to live in Cork. Salary dependent upon experience. An exciting opportunity has arisen for a talented Retail Marketing Manager to join the Dublin Head Office Team. The marketing manager will be responsible for designing and implementing Disney led corporate campaigns within Ireland. You will be leading the marketing strategy, and manage the marketing of new product launches to the relevant markets and organise launch activities, promotions, and competitive messaging. Katherine Antoine, an independent writer-director, is looking for a young producer to work closely with her during the funding application process and the production itself. Katherine will be applying to the Arts Council and the Irish Film Board for funding. Experience with such applications would be a bonus. The project is a short, experimental drama which is very performance driven. It examines the process of returning home after a long absence and grief and memory. Katherine is looking for some one who, like herself, is beginning their career and is extremely passionate about their work. A DOP has already been confirmed for project. The shoot is planned for winter 2015. The producers of the hit TV travel show ‘Ó Tholg go Tolg’, or ‘From Couch to Couch’, are looking for two new stars who will travel around Europe this summer for the third series of the show. Are you the adventurous type who would fancy a trek around Europe? Do you like meeting new and interesting people? Award-winning travel series Ó Tholg go Tolg is looking for two new couchsurfers to share their experiences on TG4. Apply now and email your CV and a short video clip (of yourself) to tolg@redpepper.ie. The closing date for applications is February 10. Brown Bag Films is currently looking to hire an experienced editor to work in their post team on exciting animation projects over the coming months. The position will involve working closely with Post Production and Production teams. • Experience and knowledge of animation is an advantage, but not essential. Showreels or online links to past work are welcome. Please clearly state what exactly you contributed to the pieces.